Berlina - a typical luxury carriage for travelling, taking its name after Berlin. It has an enclosed construction with benches facing one another. In front of the body casing there is a raised driver's box, which is covered with a coat-of-arms-blanket with the carriages for the nobility. Break - an open carriage with several rows of seats placed along or cross the carriage. The Schustala's factory produced a whole range of "Breaks" that are described in a better way under their individual names. 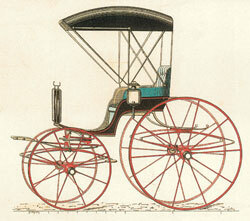 Cab - an enclosed two-seat carriage, that could have two or four wheels. It used to be a common carriage to be hired in cities. 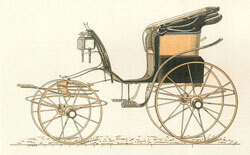 Cabriolet - an open two-seater designed to be pulled by a single horse. The two rear seats could be protected from rain by a folding roof. Calesche - an open four-wheel, four-seat carriage with a folding roof. Cart - originally, a light two-wheel carriage for load transportation. 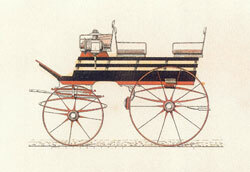 In the process of time the name "Cart" was used for a range of two-wheel carriages. It was sometimes used even for four-wheel ones. Cavalier-Break - a specific form of the original break. Char-a-bancs - its name comes from French and means "a carriage with benches". This name was used for all types of carriages for transportation of people with two benches at least (usually more) placed cross the carriage. Coupé - a short version of a Berlina, i. e. an enclosed two-seater. A Coupé was mainly used in towns and was driven by a coachman. 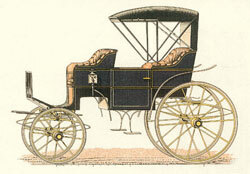 If the carriage had an emergency (tip-up) seat or a seat for a child, then it was a so-called three-quarter coupé. Derby-cart - a simple four-wheel carriage with a driver's box, and with seats behind one another. Crating placed on the sides lengthways the carriage is characteristic. Dog-cart - to be pulled by one horse, mainly two-wheel, but often four-wheel, with characteristic big wheels. Boxes for hounds transportation were situated under one or both of the benches. Dreiviertel-Coupé - such coach box is slightly bigger than with a classical coupé. In the passenger area opposite the bench, there is an emergency tip-up seat either for an adult or a child. Einfuhr-Break - a special barouche for running-in of young horses. The driver's box is very high and equipped with a piece of wood to protect the coachman from a kicking horse. Fourgon - a covered four-wheel carriage for goods transportation. The windowless box used to be often decorated with signs. A Fourgon was often called a carriage for goods transportation (van). Galawagen - a term for especially luxury carriages designed for a vehicle fleet of the nobility and monarchs' houses. From the technical point of view it is close to a Berlina and partly to a Coupé. Glas-Landauer - a type of Landauer, whose front part was not made into a folding roofing, but it had drop windows. Jagdwagen - a light, open four-wheel hunting carriage. At the rear there is usually a tip-up "bridge for the wild game" to transport the hunted down game. The Jagdwagen type was also constructed under the name of Pürchwagen. 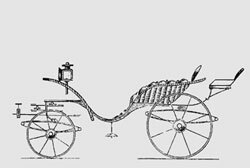 Korbwagen - any shape of carriage, whose upper construction was made of wickerwork. Such construction was used for light vehicles. 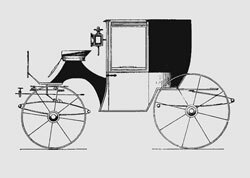 Kutschier-wagen - it does not designate a particular type of carriage, but it represents a light carriage permitting a ride without a coachman. 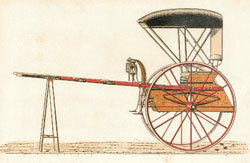 Landauer - a common version of a classical coach used by cabmen (fiacre-drivers). It is characteristic for its two-part roofing folding forwards and backwards. If the front part is not made of cloth or leather, but with glass windows, we refer to a Glas-Landauer. Landaulet - a reduced Landauer, similarly to a Coupé being a two-seater version of a Berlina, a Landaulet is really a two-seater version of a Landauer. 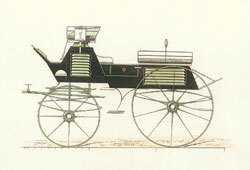 Landschützer - a simple Jagdwagen (hunting carriage), which can be equipped with a folding roofing above one row of seats. 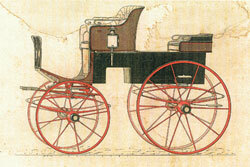 Mail-Phaeton - a massive four-wheel carriage with a driver's box and a bench for a clerk. In between there is space for luggage. The robust undercarriage is identical with the one of a Mail-Coach. 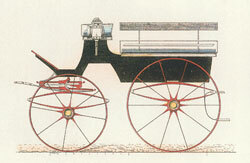 This carriage was designed for long-distance journeys in difficult grounds. Mail-Coach - a classical coach for delivering mail. The enclosed box of the carriage has boxes for luggage transportation both in the front and rear. Benches on the roof and in the rear luggage area provide seats for other passengers. Mylord - a lighter four-wheel carriage with one rear bench, a folding roof and a fixed driver's box. The version is available to be pulled by one or two horses. 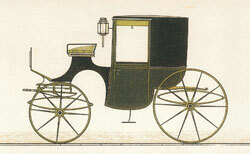 It is very similar to a Victoria type, but a Mylord was always driven by a coachman. Omnibus - an enclosed four-wheel carriage. There is a driver's box at the front, the entrance for passengers is at the rear wall of the box, seats are positioned along the carriage and are ment for four, six or more people. 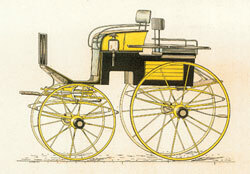 Phaeton - a light four-wheel carriage. The front bench, that is bigger and more comfortable, is a characteristic feature of the Phaeton as it was ment to be driven by the owner himself. At the rear there was a bench for servants. This type was produced in many versions. Pony-Korbwagen - a smaller wickerwork body, well suited for a pony due to its size. Pürschwagen - a different version of a Jagdwagen type, in fact. Rockaway - a characteristic feature is the roof extended above the driver's box, due to which the coachman was partly protected from bad weather. A small town in the state New York in the USA gave this type its name. Sandlaufer - its origine is Hungarian. The front and rear wheels are of similar size. The light body was mostly made of non-varnished wood. Spider - an extremely light Phaeton, whose rear seat is fastened to the frame by metal struts. Special high wheels are easily noticeable. Sulky - a minimalized one-seater on two pneumatic-tyre-wheels with a simple frame. It is used in horse racing. Tilbury - originally a light two-wheeler without an under-seat box. Later the term Tilbury served for a whole range of different two-wheelers or even four-wheelers. Victoria - similar to a Mylord, the difference is made by the driver's box that can be taken off and then the vehicle can be driven from the rear bench. Vis-`a-vis - a light carriage for two or four passengers facing one another, often without a folding roof. Wagonette - the shape is similar to a Break, but a Wagonette is considerably smaller.